If you've made it to one of our shows, you may have even met this fine fellow in person. I'm talking about writer, samurai enthusiast and stand-up philosopher Corance of the mighty GhostWerks crew. 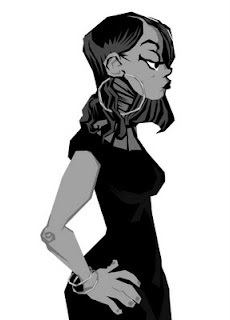 Those who bought my book Spontaneous (thanks!) 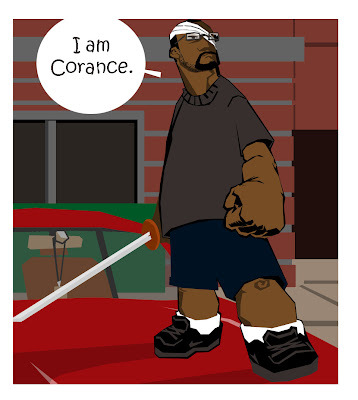 got to see the first round of a bloody grudge match between me (in full evil mode) and Corance, and the battle will be joined for real in part two of my freestyle comic, which will be available in full color next month as part of the second installment of Spontaneous. 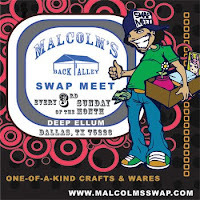 if you're gonna be in Dallas this Sunday from 11a-3p, you'll wanna swing by and see us at Malcolm's Swap Meet in Deep Ellum (click the pic for directions) where there will be tons of artists and musicians selling various t'ings just in time for your last minute holiday shopping. I'll have magazines, comics, books, prints and original art on sale there. 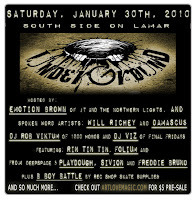 after that, it's back to the lab to prepare for Underground, the next big ArtLoveMagic event, at SouthSide on Lamar the last weekend of January. peep the flier for more info and expect more about this show as it gets closer. those that know the deal will wanna get their tickets now, while they're half price (i'm just sayin'... Don't be surprised if that show sells out before the day of...) also, that same weekend i will ALSO be at Dallas Comicon ('longside Corance, of the mighty GhostWerks crew), which i expect to kick major tail as well. Adam Hughes, Michael Golden, Jim Mahfood and Mark Brooks among others will be in attendance, so gird your loins for that joint! anyways, that's what's up. hope to see some of y'all out and about. otherwise, enjoy the holla day cheer! It ain't too much for me to JAM! Power Cosmic by Samax Amen, Khalid Robertson, Ben Moss, Josh Boulet, Michael Lagocki, David Rodriguez. 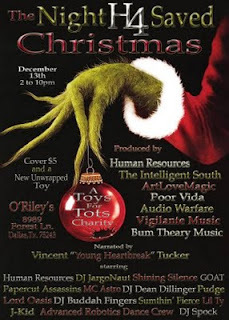 much love to everybody who came out to O'reilly's for the H4 Toys For Tots benefit show on Sunday! 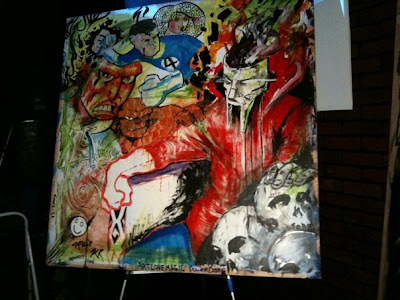 in addition to being treated to good music and art (like the live freestyle art jam/collabo Power Cosmic that me and the other ArtLoveMagic artists in attendance smashed out while the proverbial band played on), we also rustled up a gang of toys and donations for the cause! anyways, hope everybody had a good weekend! I'll be rolling with my peoples from the mighty ArtLoveMagic crew at this H4 Toys For Tots Charity Event on Sunday Dec 13 from 2pm-10pm. there will be Hip Hop and Progressive Rock performances, DJ's spinning music, and various artists will be creating art live and displaying/selling their wares for a good cause. For all of you Romosapiens and haters, we will start off the event watching/heckling the Cowboys' game, with the mighty Advanced Robotics Dance Crew doing a half-time performance and dancing throughout the event. Come out, support a good cause, have a good time, enjoy some music, art and dance. bring $5 and a New Unwrapped Toy to get in. We are having a White Elephant Christmas Raffle as well. Gifts such as an Autographed Emmitt Smith Football, Free Massage, Custom Jewelry by Ruca, Free Photshoot and plenty more. 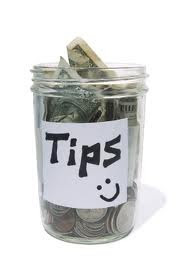 Every Admission comes with 1 raffle ticket and we will be selling additional tickets for those who got ta have 'em. Its all for a good cause. There are pooltables and dart boards for additional fun. As someone who's been a beneficiary of Toys For Tots as a kid, I was delighted to participate! for all the Dallas-area peoples, hope y'all can make it! 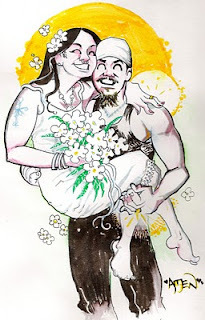 I will have comics, magazines, greeting cards and more for sale, as well as creating live at the event! 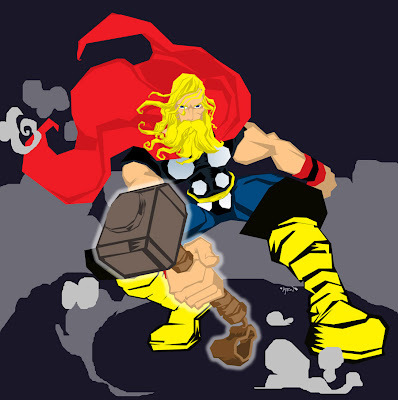 The Mighty Thor by Samax. I always loved the bearded Thor Walt Simonson drew in the comic where Thor got wounded by the death goddess Hela and started rockin' the Grizzly Adams... figured i'd hook the thunder god up with a beard for this joint. i pretty much went straight Taliban on that joker, although i doubt anyone would mistake him for Bin Laden... anyways, i made this with 100% photoshop. hope y'all like it! [UPDATE] This puppy is the Image of the month for December, so that means i'll hook anybody up with a print who's willing to part with $20. let me know if you're interested!